Our new 2 Camera CCTV system is a strong way to ensure safety and security within your home or business, acting as the perfect addition to your security system. With the use of 2 CCTV Cameras, you now have the ability to monitor multiple locations at once. This greatly increases your level of security and helps to ensure safety on your premises, while also helping to crack down on crime in the local community. Once installed, you can rest easy as our cameras will record 24 hours a day, seven days a week, for the full 365 days a year, all while giving you the full high definition experience and excellent picture quality. During the day, you can be assured of a crystal clear picture, in full colour, while after dark our cameras will automatically switch to night vision. Even in complete darkness, the two camera CCTV system will continue to shoot clear pictures, to the distance of up to 20 metres. A stronger image resolution will make catching and prosecuting criminals a far simpler task. 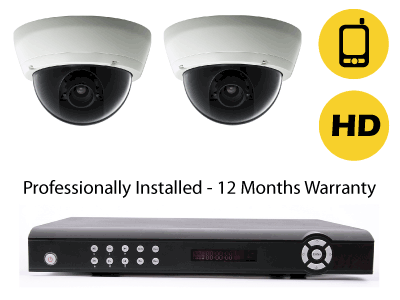 Our two camera CCTV system also includes professional installation, carried out by one of our qualified installers, local to your area. Our installers are trained with the knowledge of discrete wiring and effective camera placement. They will be able to walk you through our two camera system, supporting you in setting up and fully utilising this state of the art piece of software. This will also include remote surveillance. 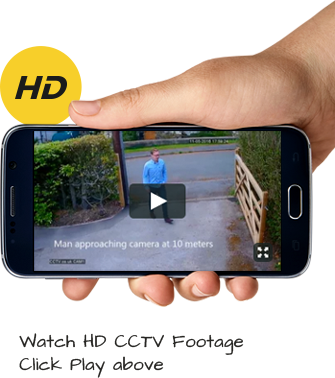 All footage recorded by our cameras can be monitored from your phone, tablet, PC or Mac and can be done so from anywhere in the world – so, even if you go away on holiday for a few weeks, you can rest easy, knowing that your property or business is safe from intrusion. All of our equipment comes with a full 12-month guarantee, so make sure you head over to our website, or call our 24 hour helpline, where our team of experts will be on hand to answer your queries. Call now, and you can join thousands of safe and satisfied customers across the country. Contact us for a quote and we shall endeavour to send you one within just 24 hours. Put your security in the hands of the number one source for CCTV installation in the country by investing in our dual camera system.